Stepping inside J and P Filipino Store, the first thing I notice is the people. A half-dozen of the owners’ friends have stopped by to chat, and they’re right in the thick of a boisterous conversation when I arrive. Perched at the corner of Madison and Courtland Avenues in Kitchener, the store is actually a renovated house. Which must be why it feels so homey. At first glance, J and P is your typical corner store piled high with canned food, snacks and frozen goods. But there’s also a cafeteria-style hot food counter at the back. Pinky Campbell — the P in J and P — tells me her best-selling dishes are spring rolls, fried tilapia, and pancit noodles. She focuses on Filipino food, but people from all backgrounds keep coming back for more. I hear a customer joking with one of the employees, teasing her for not giving him a large enough portion. 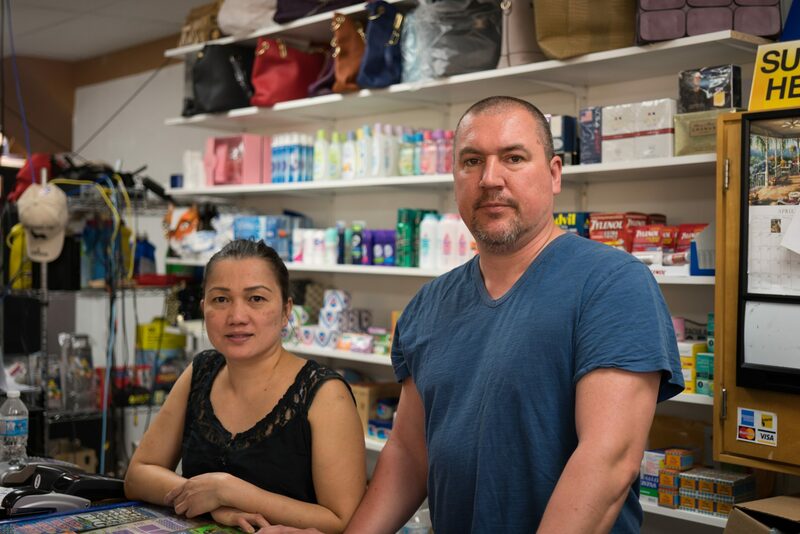 Pinky and her husband Jason Campbell have operated J and P Filipino Store since 2010. As new entrepreneurs, they sold their home to make the dream happen. “We were thinking this is a great spot for us. It’s downtown, it’s close, we can stay there. Instead of us keeping a mortgage in Forest Heights and finding another place to rent, we just sold or house and bought this,” says Jason. Takeout food and convenience-store essentials are expected in a neighbourhood corner store. But J and P’s reputation stretches much farther. Customers regularly come from as far away as Guelph, Cambridge and Mississauga to get Filipino goods that they can’t find anywhere else. J and P also offers services to help people stay in touch with their relatives in the Philippines. They’ll transfer money, ship parcels, and take passport photos. Goods and services catering to the Filipino community may be the main focus, but Jason’s Newfoundland roots also play a big part in the operation. J and P is well-stocked with salt beef, cod, tea cakes, and a range of Newfoundland-made sweets. “I have a lot of Newfoundland friends here, so instead of driving half an hour to Stoyle’s in Cambridge, we try to supply some of it here,” he says. Jason works full-time at Toyota’s Cambridge facility, then comes home to keep working at the store after his shift. Cody, Jason and Pinky’s son, is also an important part of the team. As I wrap up my interview, he enters the shop carrying a 20-pound bag of rice in each hand. He’s just finished his shift at an automotive parts supplier in Waterloo, and now he’s unloading a white cube van full of inventory for the store. It’s becoming clear to me that J and P is a real family operation. “We know all our neighbours around here. There’s a retirement building across the street, they all come over here and buy stuff,” says Jason. Jason and Pinky have built up a solid relationship with their community, but that doesn’t mean they fear change in the neighbourhood. When I mention plans for a massive redevelopment of the former Schneider’s factory, which is just a 5-minute walk from J and P, their response is welcoming. “Getting more people into the area, that would be great. It’s getting bigger and bigger here,” says Jason. As for the store itself, it’s getting bigger and bigger too. A year and a half ago, Pinky and Jason invested $40,000 in a commercial kitchen to serve hot food. Their next step is installing new windows, air conditioning, and giving the building a new paint job. The story of J and P is the story of a family building up a business in step with their community’s needs. While multi-million dollar projects might attract the most fanfare, these small independent businesses hold our neighbourhoods together and deserve to be celebrated.